If you think tool costs are the least of your problems, and believe there is little to be gained by switching suppliers, Quickgrind has some news that will make you think again. The internationally renowned carbide cutting tool manufacturer has chosen Southern Manufacturing 2015 as the stage to present its novel vending solution under a new name: the Quickgrind Tool Management System. As visitors will discover, this system is offering tool users a unique, low-risk strategy that substantially reduces costs for businesses while avoiding headaches for managers. Operating successfully for a number of customers both in the UK and overseas, the intelligent Tool ManagementSystem is based on secure, convenient, point-of-use vending machines which hold and dispense stocks – managed by Quickgrind – of every tool needed by the business. The first key advantage of this system is that the right tool is always available, immediately, so jobs are never held up by time-consuming tool searches, visits to a manned store or, worse still, emergency reordering. The second is that there is no need to tie up company cash in tool stocks or to carry out the related – and often frustrating –forecasting, auditing and managing. 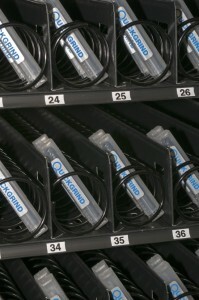 The dispensing machine contains intelligent software that monitors and reports on who is using what tools, and in what numbers. Each type of tool is always replenished ahead of being required andyou don’t pay for any tool until it is used. The tool prices are very competitive too and are the same as you would pay if ordering from Quickgrind conventionally. If you want to learn more about how Quickgrind’s Tool Management System can help save your business money you can find Quickgrind at Southern Manufacturing 2015,StandR110.